As a homeowner, you likely use your toilet with little thought; it's simply part of your home that you expect to work. When St. Charles homeowners and business owners need toilet repair, they can trust the experienced team at Mendel Plumbing & Heating. Since 1985, Mendel has offered comprehensive repair and installation services for toilets. Toilets are designed to flush effortlessly with normal human waste. Clogs can occur when homeowners, or their children, try to flush something else down the toilet. These create messy backups that can be a true plumbing emergency — especially if the home has only one toilet. Yet clogs are just one problem homeowners may face. Sometimes toilets run continuously, constantly recycling the water in the tank. While this does not interrupt your use of the toilet, it wastes up to two gallons of water per minute, adding up to hundreds of dollars a year. If your water bills are unexpectedly high, or if you notice that your water meter is running when no water is on in the house, it could be a running toilet causing the problem. Leaks can lead to similar waste, as well as damage to the flooring around the toilet. While some simple DIY methods can help, such as using a plunger when the toilet is clogged, long-term solutions require the help of a plumbing professional. Hiring a professional not only ensures that the job is done right, but also that it is done quickly. Mendel Plumbing & Heating uses the latest technology and skill of experienced mechanical technicians and plumbing professionals to keep your toilet running well and repair any problems you face. If our service technicians determine that your toilet is beyond repair, or if you are looking to have a more efficient or aesthetically pleasing toilet for your home, our team can install a new toilet and dispose of your old one. 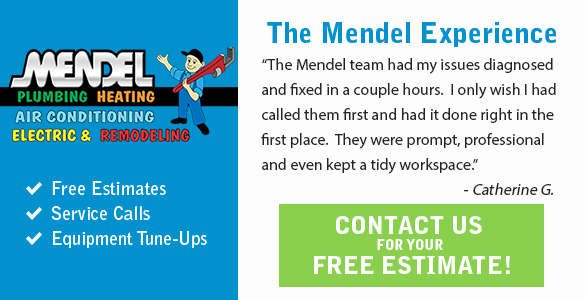 When you call Mendel Plumbing & Heating for your toilet repair, you benefit from working with a company that has built a solid reputation for customer service throughout St. Charles, Geneva, Batavia, North Aurora, South Elgin and the rest of the Fox Valley region. Our technicians work hard to get to the source of your toilet problems, and provide an honest assessment of the situation. Whether repair or replacement is right for your home, we will handle the job with courtesy and professionalism, ensuring you are fully satisfied with our work.